Following on from our previous article on counterfeit fuses, we were recently made aware of 20A plug top fuses being sold on Ebay. “The rated current may be any value not exceeding 13A. For use in plugs, the preferred rated currents are 3 A and 13 A." 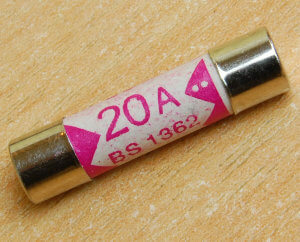 BS 1362 also specifies the information that should be on the fuse and also the colour. 3) the rated current in amperes. The fuse link barrel shall be marked in red for 3 A and brown for 13 A; for all other ratings the marking shall be black. 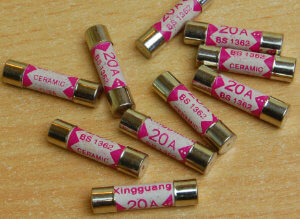 The 20A fuses we purchased are marked with ‘BS 1362’ and have the manufacturer's name 'Xingguang’. They are also marked red, which should be used only for 3A fuses. They do not have any approval marks, such as ASTA, Nemko, or a BSI Kitemark. The manufacturing standard of these fuses is particularly poor. The fuse wire is simply trapped between the end cap and body. A genuine BS1362 fuse has the internal wire connected to an eyelet inside the centre of the cap. Sand filling also contained a blob of solder! 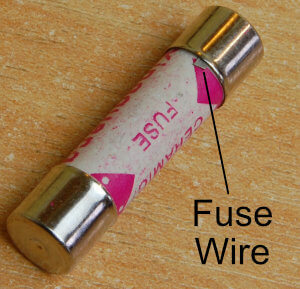 Surprisingly the fuse does contain the sand filling required, most counterfeit fuses do not have any filling. 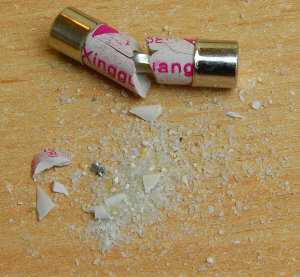 The sand is required to control the breaking operation of the fuse. Without this filling material, the air within the fuse expands as the fuse wire melts and arcs, causing the fuse to explode, as demonstrated in our previous article here. The fuse wire is a flat tape rather than round wire. 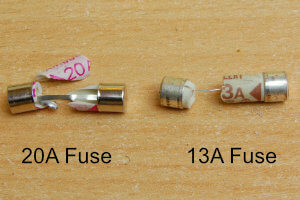 In comparison with a 13A fuse wire, it’s considerable larger. Most countries do not have fuses in their plugs, this is because they use radial circuits which are protected by either a 10A or 20A fuse or breaker in the consumer unit. British wiring regulations allow the use of ring circuits, usually protected by a 30A or 32A fuse or breaker and as such the plug is required to incorporate a fuse to protect the appliance cable. 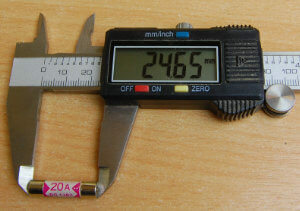 A standard 13A plug (BS 1363) is designed to fit cables up to a maximum of 1.5mm2. The maximum current capacity of a 1.5mm2 cable is 15A and should be protected by a maximum fuse size of 13A. A 20A fuse in a domestic 13A plug should never be used.